We are often asked about basic piano tuning kits. 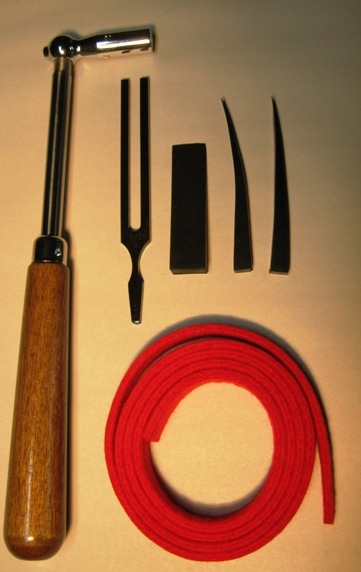 This kit contains the minimum piano tuning tools needed. It is designed for the amateur who either just wants to tune their own piano, or is thinking of learning to tune pianos. Buy the kit and save over the separate component prices. Ideal for the apprentice tuner or home enthusiast. 6" long, lacquered wood handle has a smooth tapered feel. Comes with a stationary stainless steel rod and a one-piece No. 17 Head and Tip measuring 2-1/2" long. Overall lever length is 11". You may also be interested in some books about piano tuning and/or repair and rebuilding.